I'm starting this thread first to lay out in Stan Meyer's own words what his process is and how nitrogen is the key to making his water fuel. If you believe contrary - DO NOT POST HERE - go start another thread and discuss resonant circuits, etc... this thread is to explain the very key that makes a real fuel that can be used in an engine. So many people are fixated on the water cells, but only a very small handful of people are paying attention to his earlier work that reveals his secret. First of all, this all comes down to burning the water gas. But as most of us know, a "HHO" gas from a common ducted water cell will just give you a quick pop and you cannot sustain a flame. I'm not talking about a pressurized Brown's Gas torch flame, I'm talking about a slower and cooler burning flame that allows you to get the thermal energy from the water fuel. Stan Meyer was very, very clear about this throughout his work over the entire course of time that he was involved in this research and development. He said that to control the burn rate of the water fuel, you have to mix non-combustible gases with it. That includes non-combustible gases from 1) the water has 17%+ dissolved gases according to him, 2) from the ambient air going into the intake, and 3) from the exhaust gases recycling back to mix with the water gas - of course that exhaust gas will contain non-combustible gases from sources 1 & 2. I had a special interest in nitrogen from some other technologies so that was in the back of my mind as being a possibility and that dealt mostly with allotropic or active nitrogen. That is essentially ionized nitrogen atoms that are heavily positively charged. It was brought to my attention a few years ago that NITROGEN was the non-combustible gas that Meyer was talking about specifically. The nitrogen alarm went off, I re-looked at Stan Meyer's work, and there it was plain as day - NITROGEN indeed IS the non-combustible gas that Meyer was referring to. It certainly wasn't the 1% trace gases that some "experts" are claiming. When plain HHO is ignited, it detonates instead of actually giving any real thermal combustion. The atoms and molecules just combine instantly to form a water molecule and there was a shrinkage in the volume that the gasses occupied. HHO is a mixture of about a dozen hydrogen based molecules and atoms and oxygen based molecules and atoms. It is not just a re-arranged water molecule. It works wonders as a torch flame and as a fuel supplement, but for fuel supplementation, the real benefit is coming form the reactive oxygen molecules stripping electrons from the hydrocarbon molecules breaking them into smaller pieces. That give you more BTU's our of the same amount of fuel that was put into the combustion chamber. This is the model that makes sense to me anyway and in any case, it is not the exact subject of this thread. The water is always touted as being such a wonderful byproduct - BUT, what if... that is actually what robs you of the energy that is lying right there in the hydrogen and you only get a little teaser from it. With electrolysis, nitrogen gases in the water also split to create atomic nitrogen. Nitrogen is normally very difficult to split and it has a triple electron bond - the strongest normal bond in nature. But when you do strip those electrons away, you can have a nitrogen atom that is +3 charge - it is a very strong vacuum cleaner for anything negatively charged such as some of the HHO molecules and atoms that happen to be negatively charged. Things seem to happen easier when done in water or with water. Sir Humphrey Davy said in 1807 that electrolytic hydrogen will bind with nitrogen in the presence of water when normal hydrogen will not! Now when we dilute the HHO gases with nitrogen, much of this nitrogen is ionized through the combustion and electrolysis processes. When there is atomic nitrogen, the hydrogen can attach to it creating traces of ammonia (NH3), some oxygen can bond creating traces of nitrous oxide (N2O) and other molecules. Each molecule of this is one less water molecule that forms and you were able to get more thermal energy out of the same amount of water gas that if you didn't have the nitrogen dilution. This allows the water fuel (with nitrogen) to burn slower and cooler - you get the thermal energy out of it - real combustion and not a quick Brown's Gas pop. The slow burning flames from water are the foundation of Stan Meyer's work - this is his logo. It all started with this. That is not Brown's Gas torch flames rising from the water, those are slow burning "candle flames", which is what you want for a sole fuel for an engine and not just a supplement. It's been in front of everybody's eyes since the beginning. As the only fuel, and to get enough combustion so that the engine can give enough power to turn a generator to create enough electricity to make enough fuel, this process is what is required according to Stan Meyer. This idea is embodied in every single part of his work with water fuel. Stanley Meyer says word for word: "the velocity of hydrogen is so great that the hydrogen ensuing from a nozzle will not under ordinary circumstances sustain a flame. Therefore, to sustain a flame at a nozzle attached to a hydrogen generator the burning velocity of the hydrogen gas must be reduced. " This is where it starts when it comes to understanding what Stan Meyer was up to - "...the burning velocity of the hydrogen gas must be reduced." and other non-volatile gasses such as oxygen and nitrogen. The hydrogen gas with the attendant non-volatile gasses in a controlled ratio are fed via a line to a controlled air intake system. The combined hydrogen, non-volatile gasses, and the air after intermixing are fed to a combustion chamber wherein the mixture is ignited. The exhaust gasses of the combustion chamber are returned in a closed loop arrangement to the mixing chamber for the mixture of volatile as the non-combustible gasses. More specifically, the generated hydrogen gas is fed to a gas mixing chamber, wherein the hydrogen gas is inter- mixed with non-combustible gasses. The mixture is fed to a carburator (air intake mixture) system. The gas mixture is'fed through nozzle to chamber in a jet spray. Valve or gate controls the amount of air intake to the jet spray. The gasses combine with the air to form a gas mixture of hydrogen, non-volatile gas, and oxygen. The mixture now combustible, but not volatile, is entered into a combustion chamber"
Meyer defines non-volatile NITROGEN as a non-volatile gas. He also defines the non-volatile gases as being synonymous with using the term non-combustible gases. The gases combine with AIR to form a gas mixture of hydrogen, non-volatile gas (NITROGEN) and oxygen. The mixture now combustible, but NOT VOLATILE, is not entered into the combustion chamber. Plain water gas from the cell is EXTREMELY VOLATILE. That is just the way the so-called HHO gas is. It becomes NON-VOLATILE by blending it with NITROGEN! And THAT is the key to how he ran an engine on water, air and electricity. He wasn't making big amounts of gas. He started off with common flat plated electrolysis cells with pulsed DC. No VIC and all the resonance business. That all came after and is NOT foundational to the real foundation of Stan Meyer's technology. the real foundation is a simple pulsed dc electrolysis cell gas production is diluted with NITROGEN. Without the nitrogen, the water gas is very volatile and is not in the preferred combustible state that is needed for an engine. And you can take a look at adding a magnetic coil around the pipes as well as applying a vacuum to the cell, but this is the basic concept. You can see the HHO from the bottom blends with ambient air and then it gets burned. The exhaust from the flame goes to the environment and some is recaptured to go dilute the hho and ambient air mix to be reburned. You can also see the flat plate electrolysis cell - well before any of the resonant WFC tube setups. The sub-atomic action of the direct current voltage on the non-electrolytic water causes the hydrogen and oxygen atoms to be separated--and similarly other gasses entrapped in the water such as nitrogen. (Meaning the NITROGEN IS ALSO SEPARATED or IONIZED during electrolysis. There is 17% Nitrogen in water. For extra nitrogen, ambient air and exhaust is constantly condensed in a loop). the velocity of hydrogen is so great that the hydrogen ensuing from a nozzle will not under ordinary circumstances sustain a flame. Therefore, to sustain a flame at a nozzle attached to a hydrogen generator the burning velocity of the hydrogen gas must be reduced. There are a lot more references from Meyer specifically spelling out that NITROGEN is the non-combustible gases that he is always referencing. Just in these references already, we can see that this is the key to making a suitable fuel and Meyer started with flat plate electrolyzers and simple pulsed DC. If you search any of those references, you can pull up the patents. This thread has already debunked every Stan Meyer "expert" who claims that there are no references by Meyer that ever names Nitrogen. Well, here are a few and there are a lot more. I put my favorite reference in this report that I'm offering. You can just take the time and search and you will find them if you don't want the report. They're all online and have been for years. I thought it was pretty obvious that when he said 'non-combustible gases' he meant Nitrogen (Air). It wouldn't be reasonable or cost effective to use any other gas because you would have to buy tanks of it. A lot of the simple points that Stan made clearly seem to be misunderstood or ignored by most of the people studying his work so I guess this is no exception. These patents are initial approach of Meyer to understand a new way for obtain more thermal energy. The explaination of combustion is wrong because the engine is in fact an mechanical atomic reactor.. When reaction is started you obtain as result an change of state of molecules that you sent inside thanks to the compression. You start the combustion mixing the fuel (CxxHxx molecule) with air (oxygen/nitrogen) obtaining COx and NOx as exaust gas. The main problem is that the energy produced from compression does not have enough power for dissociated the nitrogen molecules, as result you have inert gas into the exaust gas. We are born in petrol era and we know that your car for run need gasoline or diesel. At today an endothermic engine use the oxygen, present in air, just as the oxydant of fuel, this explaination is correct in part because the process of combustion isn't understand completely.. Returning to Stan Meyer.. probably during some tests has found that air have enough power and the initial researchs using exaust gas (nitrogen and water vapour) with watergas are changed ionizing the air and mixing with watergas. But Stan Meyer don't has clear the reaction because sometimes works and sometimes not. From that reason Stan have the idea to wfc injector, an all in one device. Good intuition but with more electrical and mechanical problems. After we know all that Stan is died and this technology is was lost.. In this year 2013 an italian team has found the right way for transform air into fuel because this is the year of energy revolution for the benefit for all peoples. Yes, but Stan Meyer apparently did not understand all the reactions. This thread is for documentation of Stan Meyer's concept of slowing the burn rate of fuel. Engines have more nitrogen and less oxygen leaving the exhaust than went into the air intake as if oxygen is split into a nitrogen atom and hydrogen atom. We can discuss those atomic concepts in another thread. Do have any hint on how the Quenching Circuit Technology worked..? this is also the key in Co-equalling the burn rate to match with the Fossil fuel burn rate. 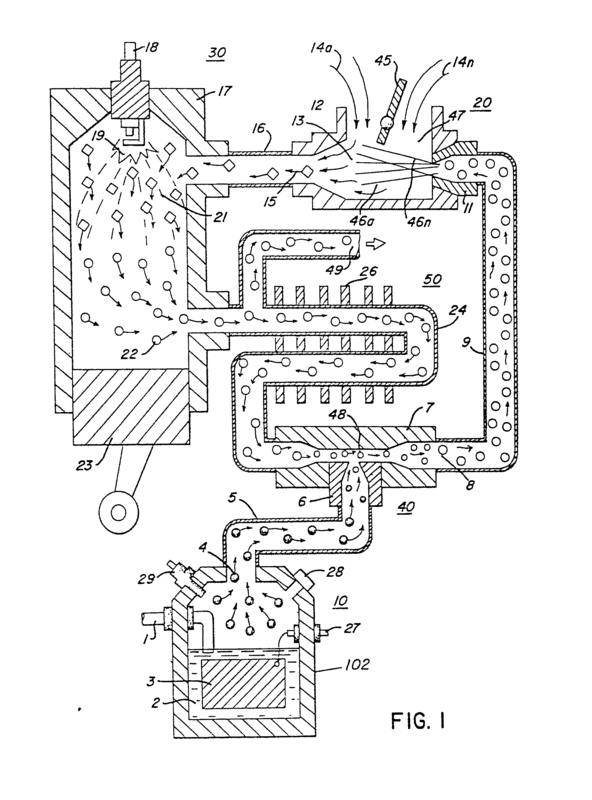 Stan' s patent indicate Hydrogen Flame used for heating applications using the Quenching tube..
Actually, I don't believe the quenching tubes are necessary because all the patents discussing nitrogen were before Meyer ever did anything with the quenching tubes. I think the quenching disk/tubes is mostly for preventing flashback. The quenching tube does put the hydrogen and the nitrogen released from the water in intimate contact though. yes that is true.. quenching is just used for security.. if you want to make reactions you need high temperature, pressure or catalyst and pure nitrogen. With nitrogen you cam make ammonia and run an engine.. nitrogen can be the ONLY substitute of carbon.